The soundtrack from the film includes an original score composed by Hans Zimmer and performed by an orchestra. Lisa Gerrard’s vocals are featured on a few tracks, though her voice is used more like another instrument. She mesmerizes the listener with her somber and beautiful tone. 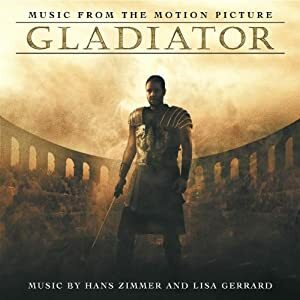 The music is fitting for a fantasy setting and features a wide range of moods, from quiet and calm scenes to dramatic moments and – of course – the battle scores that made the film so famous- not quite appropriate for a small bar room skirmish, but much more fitting for a large scale battle or an epic struggle against an all powerful ally. A MUST for any fantasy campaign! It breaks my heart not to give this a 5-note rating, because if I were just rating it for awesomeness, 5 wouldn’t even be enough. My only issue that a goodly number of tracks on this album have a very specific feel to them, such as “The Wheat” and “The Emperor is Dead”. Oh hell, nevermind, this music is too awesome to not get a 5-note rating. If you have specific scenes that this music will fit in (and much of it great for battles and the like, as DM said) then you’ll be hard pressed to find better music.